Catalogs are not a thing of the past. In fact, people enjoy receiving catalogs more than you’d think. The average time spent looking at a catalog is 15.5 minutes and consumers tend to hold on to them for several weeks, says a study. You may want to re-consider rolling out catalogs for the next holiday season or even for a spring refresh! Through stories and images, catalogs take people on a journey or even an adventure, that’s why they encourage deeper engagement with retailers and their products. Research shows that the average length of time of keeping catalogs is 20.3 days, and 84% enjoy getting catalogs from retailer(s) they previously shopped with. Catalogs inspire and generate new ideas – and they do best when paired with another marketing channel, such as an e-commerce site. Tip: extend your brand identity by using the same tone and imagery throughout all your media channels, including online, social media and print. Be sure to include multiple ordering options in every medium. Need help getting consumers to remember you? Start with a physical journey that jumps off to a digital one. Catalogs offer the perfect physical platform for integrating dynamic digital technologies such as augmented reality (AR), dynamic QR Code®, near field communication (NFC) and much more.7 These technologies can help you deliver engaging interactive experiences that jump off the page to drive consumers to brand experiences they will remember, as well as to your digital properties, such as websites, mobile apps, social media, etc. 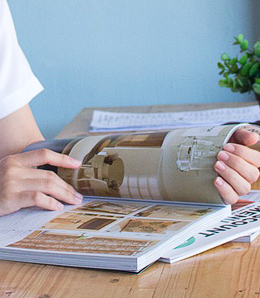 From the feel of the paper on your fingertips to the visual appeal of the images, catalogs give readers a real and multidimensional experience that stimulates multiple senses simultaneously. These physical experiences help make memories and connections. They also inspire readers with possibilities, helping to provide an escape from daily stresses. Studies show that catalogs even help ease the anxiety around receiving bills. Thanks to large industry databases containing demographic information on millions of households, targeting with catalogs is much easier now. And thanks to online purchasing, many retailers have amassed their own databases that can be used to segment their customers by type and buyer behavior. Identifying niches and verticals helps you target only high-quality leads—so you get the right catalogs to the right people. Whereas the internet is fast, the catalog is slow – inviting readers to sit down and sift through the pages slowly perhaps with a cup of tea in hand. This gives them time to discover new items and make the best purchasing decisions. Browsers can consume the catalog without WiFi, on their own pace and at their own schedule, allowing for fewer distractions. Even though they are a tech generation, millennials are embracing mail. So why do these digital natives love direct mail? “In part, it’s because they are inundated with digital media. Physical mail stands out in millennials’ otherwise electronic world. This generation is also geared toward visual content, and direct mail caters to the physical senses.” This important buyer segment also spends more time sorting mail than other age groups and appears more engaged with mail than the average consumer. This is true for other generations as well. In fact, baby boomers and Gen Xers report strong childhood connections to catalogs prompting feelings of curiosity, hope, and excitement. Today’s catalogs are powerful marketing tools. It encourages buyers to slow down and make more concrete decisions with less distraction. This article was excerpted from InkOnDaPaper’s article 10 Reasons Why Catalogs are a Marketing Powerhouse.